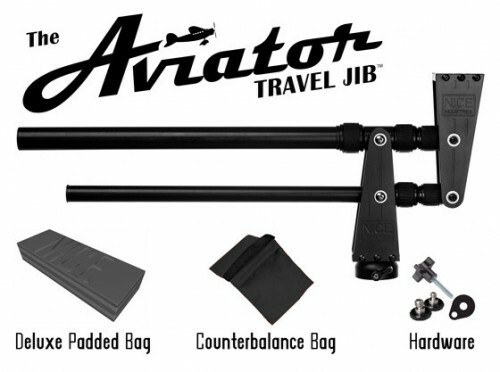 Aviator Travel Jib Brings Big Budget Cinematography For Little Budget Cinematographers | OhGizmo! By David Ponce on 06/14/12 • Leave a comment! There’s a few things you can to do take your video from shaky-hand amateur to Indie-film-award good. One is to get your camera on rails, or even on wheels. But to kick things up even more, you need a jib. This is a counter-weighted arm that lets you move your camera around in the air in a smooth motion. Jibs however are usually really unwieldy, heavy and most of all, expensive. The Aviator Travel Jib you see above is none of those. Weighing in at 3.75 pounds and 24-inches compacted, the jib extends to 6 feet and can hold a camera weighing 6 pounds. It’s fully funded on Kickstarter now and to get it you need to pledge $400 to get the jib, ballast, mounting hardware and a bubble level, while students can get the jib alone for $300.